With a tough matchup against the Houston Texans in the Divisional Round of the AFC Playoffs at M&T Bank Stadium this Sunday, the Baltimore Ravens are eager to have their star wide receiver Anquan Boldin return to the lineup. Boldin, the team’s leading wide receiver with 887 yards on 57 catches, missed the final two regular-season games after he had surgery on Dec. 22 to repair a partial tear in his meniscus. Despite being sidelined while his team secured its third AFC North Division crown in franchise history and clinched a #2 seed and a first-round bye in the playoffs, Boldin remained active with his off-the-field charitable work through his foundation. The Anquan Boldin Foundation (Q81 Foundation), which was founded in 2004 during Boldin’s second year in the league and is dedicated to expanding the educational and life opportunities of underprivileged children, participated in several events and initiatives over the winter holidays. 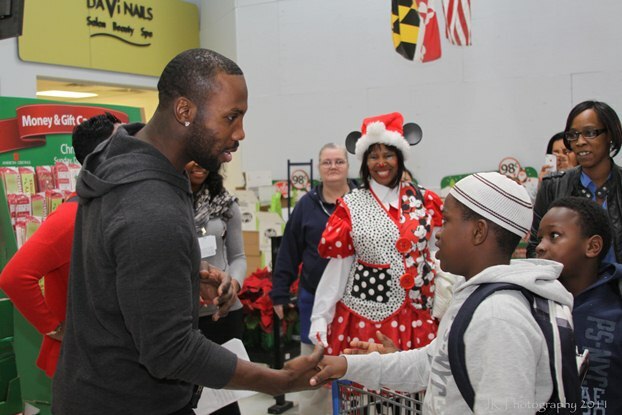 Most recently, the Q81 Foundation hosted its 4th annual holiday shopping spree during Christmas week in which 200 kids in Baltimore and South Florida received $100 gift cards and a chance to shop with Boldin and his Q81 team at Wal-Mart. There was also a donation of toys in Phoenix, the city where Boldin began his NFL career. Boldin was equally as busy spreading the holiday cheer in November. The Q81 Foundation hosted the All-Star Thanksgiving Feast at the Sam’s Club in Lantana, Florida in partnership with Abram Elam (Cowboys), Brandon Flowers (Chiefs), WEDR 99 Jamz, and the Produce Connection. In an international initiative, he teamed up with his former Arizona Cardinals teammate Larry Fitzgerald in a public service announcement calling on football fans and others to support efforts to raise awareness about the ongoing drought in East Africa and bring critically needed food and water to famine-stricken people in the region. More than 13 million people in Ethiopia, Somalia, and Kenya have been affected by the disaster. Lastly, the Q81 Foundation’s Inaugural Fundraiser Dinner was held in Baltimore at M&T Bank Stadium, a great cause which I had the privilege of attending along with around 200 other guests and several of Boldin’s teammates. We caught up with the 3-time Pro Bowler and the 2010 Ravens’ Walter Payton Man of the Year recipient to talk about philanthropy and get his advice for aspiring pro athletes interested in giving back to the community. Q: Recently you were quoted as saying: "I don't want to be just another guy who played in the NFL. We have a bigger purpose to touch lives and I'm trying to do that." What drives your passion to give back to the community and why is it important to leverage your celebrity for this purpose? Boldin: For me, I come from humble backgrounds. I come from a less fortunate area. I’ve seen a lot of people struggle. There’s a lot of struggles out there. People have real problems. And I think for me, I didn’t get to where I am by myself. I had a lot of people helping me along the way, so I feel that it’s only right that I help others. Q: What’s the most rewarding aspect of having your own Foundation? Boldin: Being able to help people. That’s what we all get into it for. You know for me, I really didn’t want to start a foundation when I got into the NFL because I wanted to do everything under the table. But somebody convinced me to do it, letting me know that if people understand what you’re trying to do they will be more than willing to help. So I was more than willing when he put it that way. Q: What advice would you give to younger athletes rising up in the ranks in terms of giving back when they get to the league and want to start their own foundations? Boldin: I mean just follow your heart. I think we all have something that’s close and near to our hearts. For me, it’s helping less fortunate kids. For somebody else, they probably dealt with cancer in their family or something like that. I would say whatever that passion is, follow it and go after it. There’s a lot of people out there who need help, and with the celebrity that we have we can help bring light to that. Q: What are some of the biggest pitfalls you’ve encountered in terms of establishing your own charity? Boldin: I think the great thing about it is whenever you start a foundation or anything like that you have to put a put a team of good people around you. People with the same goals that you have. You know a lot of times when you get involved with foundations, people tend to get into it for the wrong reasons—money being one of them. So I think you have to have people that have the same passion that you have and go from there. Photo courtesy of Josh Katz/Jk Photography.